NEW ORLEANS - The National Weather Service has issued a heat advisory for north Louisiana. Forecasters say a strong upper level ridge of high pressure will expand northward from central Texas into the lower Mississippi Valley through Thursday. 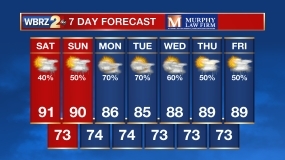 Meteorologist Mario Valverde in Shreveport says this will result in the hottest temperatures so far this year as they climb into the upper 90s by Thursday afternoon. Combined with the high humidity, Valverde says the heat index, or the "feels like" temperature will range from 105 to 108 degrees. He says those who work outside should take extra precautions. Health providers recommend wearing light weight and loose fitting clothing and drink plenty of water.